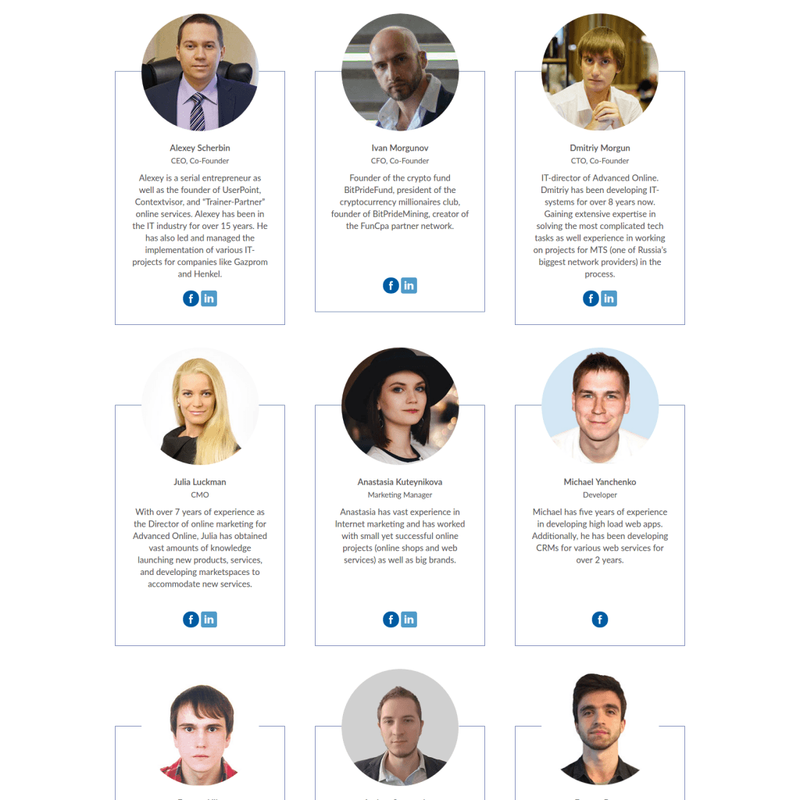 Safinus is a platform, where new entrants to the crypto market can join profitable Cryptocurrency and ICOs Portfolios created and handled by experienced cryptoinvestors.And our mission is to make highly profitable cryptocurrency investments easily accessible to a broad range of market newcomers, while allowing experienced market participants to significantly increase their managed assets and profits. Established investors make funds managed on a platform using their own money. They then trade on forthcoming cryptocurrency startups and established coins. 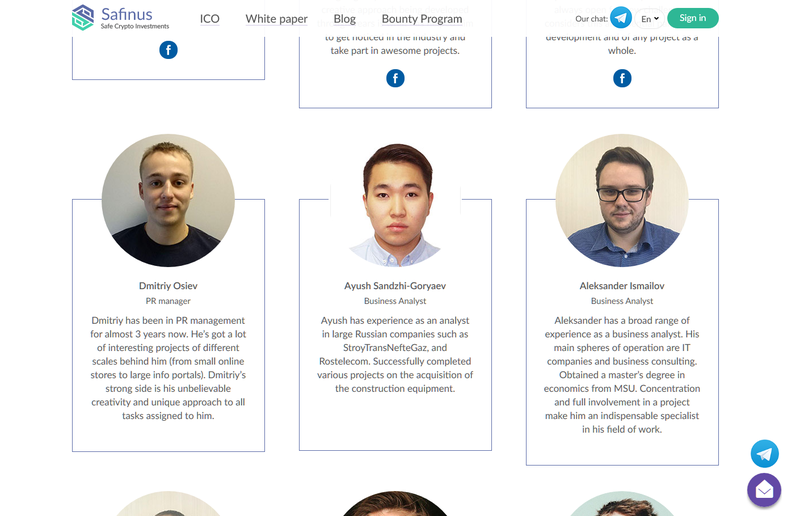 Their performance, good or bad, is stored on the Safinus platform for other investors to view. Depending on their performance, these managers can outperform or outperform coins such as Bitcoin or Ethereum, or indexes like Top 10 or Top 30 cryptocurrencies. In case they outperform the market, other investors, especially beginner investors, may want to join the fund. Portfolio creation mechanism, which allows experienced investors (or funds) to create their cryptocurrency and ICO portfolios on the platform, and any (even the most inexperienced) investors to join a portfolio with his funds in just a few clicks. Universal portfolio rating, that is created automatically through saved and verified Blockchain information regarding portfolio earnings. Individual cryptoasset management mechanism, that allows professional traders to cater to large investors individually. Voting system for adding cryptocurrencies and ICO, which allows only community and trader verified authentic cryptocurrencies and ICO's to be added to the platform. It protects platform users from scams. Mechanism for simultaneous trading on multiple exchanges through a single interface, which guarantees asset liquidity in portfolios. The decentralized cryptocurrency exchange, which will replace centralized services and will allow assets to be controlled transparently, and with absolute security in the future. Instruments for the automatization of cryptocurrency trade strategies and portfolio management. In order to launch a portfolio on the Safinus platform, a trader must have a minimum balance of 200 SAF tokens. 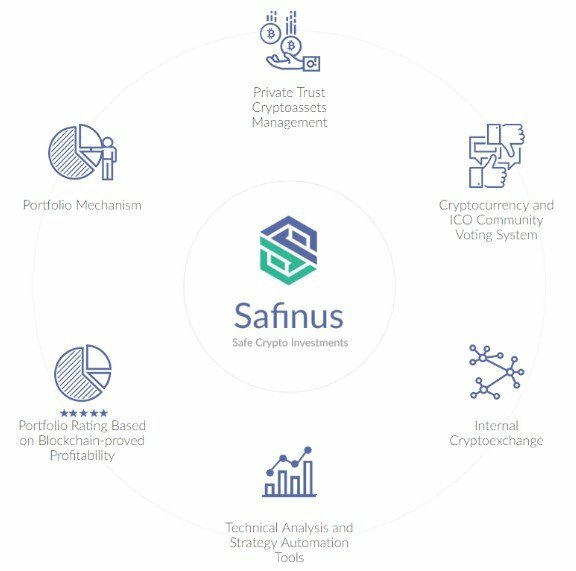 Furthermore, the Safinus platform will take a 10% commission fee based on the profits a trader makes utilizing investor funds. The commission will be taken from the trader’s SAF balance. Ability to create individual portfolios on the platform and establish join criteria. Creating a portfolio on a platform, an experienced investor or cryptofund can dramatically increase the amount of managed funds and personal income. Globalization of activities. This platform allows portfolio managers to attract new investors not only from other countries or regions, but around the world. Customization services. Portfolio managers have the ability to offer different services to investors of various levels. Automated asset control strategies. This platform allows for the automation of cryptocurrency trades with the goal of minimizing the time and energy of portfolio managers spent. Ability to prove profit. Available portfolio ratings by platform and openly available transaction information increase the amount of trust given to portfolio managers. No need to understand the mechanisms of Blockchain, cryptocurrency, and ICO. Only a few clicks are required to invest and then choose an attractive portfolio of rankings and merges. An investor can verify that earnings reported by cryptofund are actually authentic. All transactions are recorded in Blockchain, data is available on every investment. Investors face significantly smaller entry obstacles. Currently, it is unfavorable for cryptofund to work with small capital. The platform, however, allows one to join a portfolio at a price of $ 100. Trusted individual management for large investors. If an individual wants to invest more than $ 100k, he can choose a manager of rank and discuss terms of agreement individually. After that, portfolio managers can create a separate portfolio that can be followed by large investors. There are several platforms that are trying to solve the current problem. However, the solution they provide is far from complete. Platforms that seek to connect portfolio managers with investors have very limited functionality, or vice versa, too many unnecessary elements, which complicate the trading of assets and investments. Some solutions may not be realized in the face of emerging technologies, or legal restrictions. Safinus accumulates competitor best practices and removes their shortcomings. This, together with Safinus’ own innovative solutions will make it possible to create the best platforms, providing security and ease of use for all users. 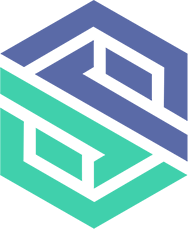 The SAF Token is a utility token that will be used to access the Safinus platform and pay commissions for the platform’s use. Traders and funds buy SAF tokens upon registration. Following this, investment portfolios can be made on the platform by traders and funds in order to attract clients and investors. All of the commissions of the Safinus platform will be taken in the form of SAF tokens.